The following two visions of Kali—one by Paramhansa Yogananda when he was the young Mukunda and the other by the Bengali poet Ramprasad Sen—are described by Swami Kriyananda in his book Paramhansa Yogananda: A Biography. Thousands of Suns and Moon from Thy body do shine! 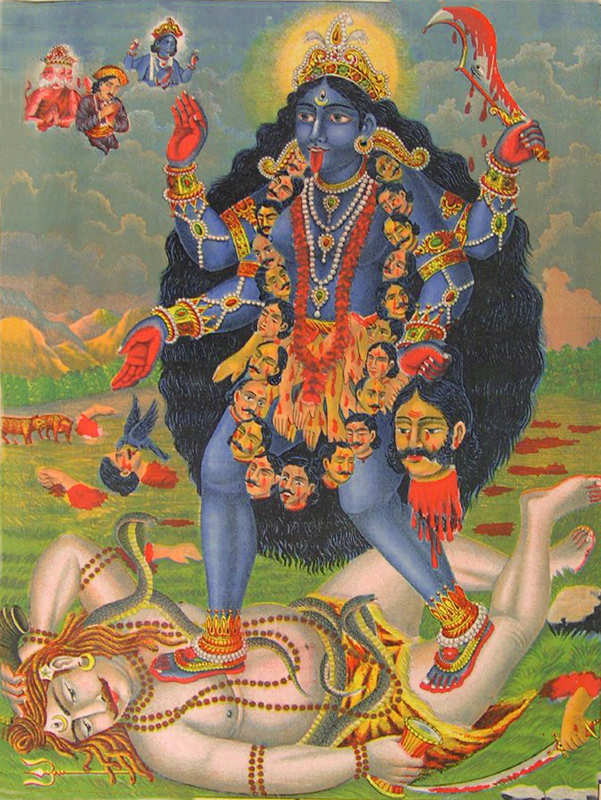 Kali represents Mother Nature. Her four arms symbolize Creation, Preservation, and Destruction, the fourth depicting the gift of salvation to those who go beyond Nature to the heart of Infinity. The garland of skulls signifies Her divine omnipresence in all human minds. Why skulls? Because all human life is temporary. Her hair streaming outward signifies God’s energy reaching out through all Creation. In Her dance, the rhythmic steps signify the vibratory nature of Creation. Her husband Shiva is depicted as lying prostrate, because God the Father, the Eternal Spirit, is beyond Creation, beyond all vibration, alive in the vibrationless void of Brahman (Spirit). Kali’s dance ceases when Her light footsteps touch the breast of the Infinite. The reason She is shown with Her tongue out is that She suddenly realizes She has gone too far! Finitude cannot penetrate into the heart of Infinity. This entry was posted in cosmic mother, divine mother, kali, kriyananda, prayer, ramprasad and tagged divine mother, kali, kriyananda, ram proshad, ramprasad, yogananda. Bookmark the permalink. Berry nice and beautiful, thanks! !